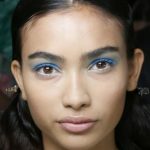 If there was only one makeup color you could wear this spring it would be blue! You might think it is too 80s and retro but makeup experts think otherwise. Shades of cobalt, azure, sapphire, aqua have been reformed to make you look chic and sophisticated. Many fashion designers chose the blue-eyed look for their spring/summer 2014 collections. And they did so in many different ways. 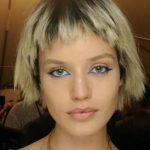 Marc Jacobs, for his Marc by Marc Jacobs collection, and Giorgio Armani, presented one of the boldest blue-eyed looks of the season. Their models wore electric blue and turquoise eyeshadows across the upper lid creating a dramatic yet pop look. 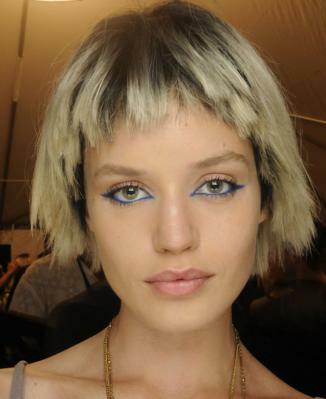 Some of Marc Jacobs’s models also wore an electric blue eyeliner at the lower lash line. 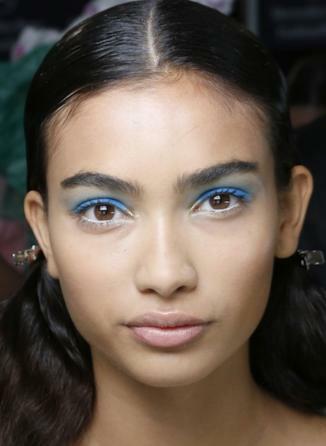 Models at Zoe’s Jordan show presented a more reserved use of the blue eyeliner; a hint of blue eyeliner at the inner corner of the eye followed by black for the rest of the lid. The duo of fashion label Badgley Mischka, as well as Miu Miu, wanted to create a youthful charm and went for a wash of pastel aqua hues across the lids (from lashes to brows almost). Miuccia Prada and her offbeat collection blended perfectly with the new “spray-effect” application of petrol blue eyeshadow. 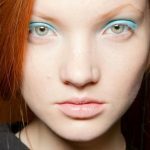 The blue makeup trend is totally wearable and can be worn by blondes, brunettes and redheads, with dark or light skin tone. Light skin tone: cool blue shades, like shadow blue, and silver-blue hues will look perfect on light skin without overpowering the skin’s natural complexion. And sapphire, only in an eyeliner. Medium skin tone: turquoise, petrol or electric blue hues are ideal for this complexion. This skin tone can easily tolerate shimmer also. regardless of whether you are using eyeshadow or just a blue eyeliner, you need to keep the rest of your makeup minimal to let the color pop. it is best to use a color-correcting eyelid primer, to create an even canvas. This way your natural skin color tone will not affect the final color the eyeshadow will have on your eyes. mature ladies should go for more subtle blues, since bright, vivid colors tend to emphasize on wrinkles and/or fine lines. there is a big debate whether women with blue eyes should wear matching eyeshadow. Even the makeup world cannot make up its mind. 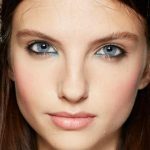 Still, many makeup artists love to line blue eyes with blue eyeshadow (never using the same shade eyeshadow as the eye color). This way the blue in the eyes really pops. if you are going for a blue eyeliner, use brighter shades on bottom lid and dark shades on top. for a more professional look, it is best to use two shadows. Apply a lighter one on your lids and a darker one to the outer corners. Whether you choose a touch of electric blue eyeliner or a pale turquoise across your upper lid, there is definitely one shade of blue for you!